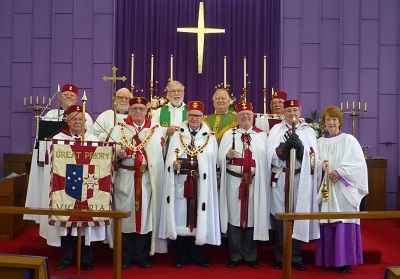 On Sunday 27th August, Great Priory and members of the Masonic Order of Knights Templar attended St John The Beloved. The church was full and the leaders were seated in the sanctuary and participated in the readings. Fr Ian Hunter was also in the sanctuary and assisted in giving communion to so many people. The altar was flanked by the banners of the Order, and the members processed into the church in their medieval regalia to the hymn “Soldiers of Christ, arise”. The church was full of members and their families, in addition to our own parishioners.